Cadence Collective: Year One Anthology! 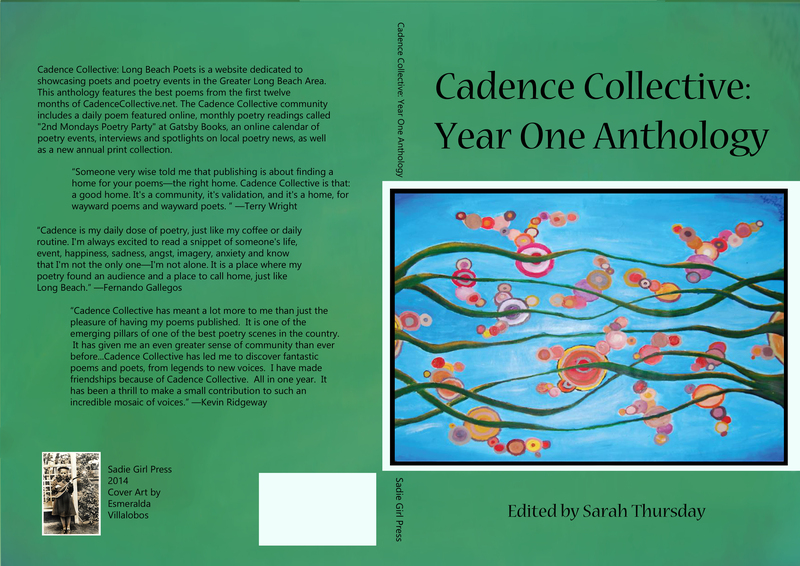 After an entire year of daily poetry and three long months of selecting, editing, designing, and proofreading (no summer vacation for this teacher), Cadence Collective is proud to announce its Year One Anthology. We are releasing a beautiful, soft cover, printed-on-paper, actual book that includes over 100 poems by 57 Cadence poets who have been connected to the Long Beach community. Books will be available for only $15 at many fine independent bookstores in the Greater Long Beach Area and beyond, such as Gatsby Books (Long Beach), Read On Till Morning (San Pedro), and Half Off Books (Whittier). If you have an independent bookstore who you’d like to recommend to carry our anthology, please let us know at CadenceCollectiveLBP@gmail.com. I am so proud to have this collection ready for you all! Have a look and buy one for yourself.